I don’t feel like doing a Christmas gift guide this year, there are many other blogs and websites where you can find those and they’ll be done way better than my guide. But if I happen to come across something fragrant that’s worth your attention, something that becomes a lemming as soon as you look at it, you’ll be the first ones to hear from me. And I just did find something pretty! Among hundrets of niche perfume brands JUL ET MAD is one of my favorites & has a high place on my list; I’m always excited to read about their new developments. They’re also a perfect example of thinking about perfume lovers and clients in general. The brand is more high-end and luxurious, their awesome fragrances are crafted with high quality essences, but you have options to choose from. If you don’t need a full coffret with a sparkly flacon you can pick a minimalistic version – a perfume in a sanded glass bottle in a plain box (called Love Basics). But that’s not all, if 50 ml is too much you can opt for a sleek black travel spray – Le Compagnon which holds 20 ml of the perfume. JUL ET MAD also offers you a possibility to try their line through 5 ml miniature. Could it get any better? Oh yes it could! And it does! That mini, known as Love Dose have just gone through a total metamorphosis. From now on they hold 7 ml instead of 5 and have been repackaged into elegant & handy vials with sprays (instead of splash). Get a separate one (€25-28) as a perfect stocking stuffer or one of two available coffrets (€115-145) to gift more luxury. Plus they are refillable too! It’s the first weekend of both calendar and astronomical Spring but it doesn’t feel at all like the new season, that of awakening and revival has begun. Here where I live the sky is gloomy now, it’s also cold and windy at the moment. There was even some snow falling on the 21st of March! Of course I know that Spring is going to come but I wish it better do it sooner than later. Easter is just 1 week away & it would’ve been great if the weather was nice enough to be able to go for a walk in the park after enjoying some good food with my family. Despite this aura I’m trying to keep my optimism high. Just after Easter I’ll be going to Milan for 10th edition of Esxence. I’m very excited about it. Also few days ago I got a new pair of glasses – something completely different than I used to wear so far. You could say that I’m reinventing myself a bit for the Spring. 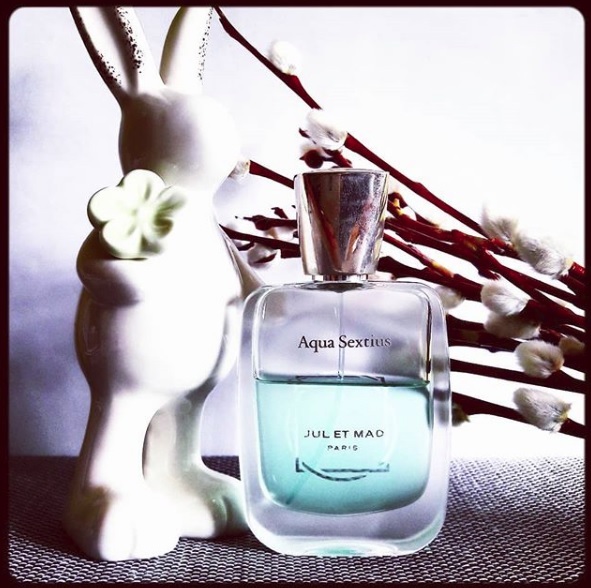 Meanwhile I’m wearing Aqua Sextius from Jul et Mad which is my interpretation of a ‘Spring in a bottle’ fragrance. What is a perfume you like that gives you a Spring mood vibe?